Quality in a one shape pattern (no front or hind). 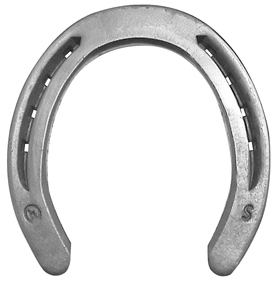 The placement of the nails in a V-shaped crease allows you to nail with confidence, knowing the integrity of the hoof will not be compromised. Fuller toe, inside bevel, sole relief and slight taper to heel area. The pricing of the Standard is very competitive, the quality is unsurpassed. Shoes are symmetrical. Now available with sole relief. Standard Lite is the same quality as the well-known Standard Series shoe, in a lighter version with 18×7 steel size. Standard Punched for 5 City or 5 Slim. Standared Lite Punched for 4-1/2 Regular, 5 Race, 5 City or 5 Slim, depending on size.